Amesbury at (Landry Stadium) Middle School: (220 Main St., Amesbury): Proceed on Rt. 95 north and exit at Rt. 110 for Rt. 495. Proceed under Rt. 495 and turn right onto Main Street. Amesbury at (Town Park) High School: (26 Highland St., Amesbury). Take I 95 North to exit 58B to merge onto Rt 110/Macy St toward Amesbury/I-495 - 0.4 mi. Slight left at Macy St - 1.3 mi. Turn right at Main St - 0.2 mi. Take the 3rd left onto Greenwood St - 0.2 mi. Take the 1st right onto Highland St - 0.1 mi. Slight left to stay on Highland St. Destination will be on the right - 0.3 mi. Danvers High School: (60 Cabot Road): Cherry Street in Wenham to Burley Street to Cabot Road. High School is on the right. Hamilton Wenham at HW Regional High School: (775 Bay Rd, Hamilton): Take Rt. 1A North from Rt. 128. Go through center of town. Park is on left after Fire/Police station. Follow approx. 2 miles, High School is on the right, field is behind school. Hamilton Wenham at The Pingree School: (537 Highland St., Hamilton): From Route 1A in Hamilton: Either from the South or North on Rt. 1A turn onto Asbury Street which is beside Patton Park across from the Police Station near the center of Hamilton. Follow Asbury Street 1.1 miles. Turn right at the end of Asbury Street. You are then on Highland Street. Stay straight on Highland Street. Do not bear left on the continuation of Asbury Street. Follow Highland Ave straight past the US Gas station. Pingree School is about 1 mile down Highland Street on your right. Ipswich Town Hall Field: (25 Green Street): Rt1A north into Ipswich, pass Argilla Road (to Crane’s Beach) and go straight onto County Road/Jeffrey’s Neck Road. Turn right onto Green Street. Field is on the right. Marblehead at Gatchell Field: (West Shore Drive): Rt1A south to Rt. 114 east and bear left at Salem State College. Proceed along Rt. 114 to first stoplight and turn left onto West Shore Drive and immediately turn left into the Gatchell Field parking lot. Masconomet at Pye Brook Park: From Topsfield center, take Rt. 97 north towards Boxford/Georgetown for 1.5 miles and turn left at the sign for the Pye Brook Park. Newburyport at Nock Middle School: Route 95 North to Exit 56 Scotland Road. Take a right off the ramp onto Scotland Road. The Newbury State Police barracks will be on your left after you turn off the ramp. Follow down through the Newburyport Industrial Park. Go straight through the first traffic light - Scotland Road will become Graf Road. At the end of the road you will come to 3-way intersection Fuller Field will be straight ahead). Take a left onto Low Street. The Nock Middle School will be just ahead on your right – just after you pass Johnson Street (on your right). Just before you reach the front of the school, take a right into the school’s parking lot. When you enter the parking lot from Low Street, the field will be straight ahead. Newburyport at the High School: 241 High Street, Newburyport, MA 01950): From Rt. 1A North: When you reach the Newbury / Newburyport Line, Newburyport High School is about 2 miles up on the left. At the High School take a left onto Toppans Lane & take your first left into the “loop” in the front of the school. OR From Rt. 95 North/South: Take Rt. 95 North/South to Exit #57 (Newburyport / W. Newbury) to Rt. 113 East (Storey Avenue). Follow down through 4 traffic lights & continue East on Rt. 113 / 1A East. Newburyport High School is about 1.5 – 2 miles down on the right. Take a right onto Toppans Lane & take your first left into the “loop” in the front of the school. North Andover High School (Walsh Field): Take Rt 114 West into North Andover. Take right onto Rt 125 at Bertucci's. Take Rt 125 east approximately 1 mile to the 4th set of lights (Main St). Take right onto Main St to police station on left (0.2 miles). Take left at police station and follow road for 0.3 miles. Entrance to North Andover HS will be on your left. North Andover Middle School: Take Rt 114 West into North Andover. Take right onto Rt 125 at Bertucci's.Take Rt 125 east to lights at Main St. Take left onto Main St and Middle School will be on your immediate left. Field is behind the school. North Reading High School (191 Park Street): Rt 128 South to exit 40 and take right onto Haverhill Street. Left onto Rt. 62. High School is on the right. 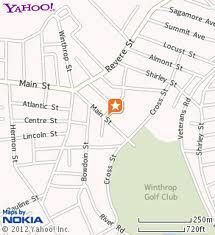 Pentucket Regional Schools: (22 Main St, W. Newbury) Take Rt 97 to Georgetown center. Follow route 97 to Groveland Center. At center of Groveland turn right onto route 113. The Pentucket Regional Schools are approximately 1 mile on the left. The HS is the first building straight ahead. Bear left for the Middle School which is the second building on the right. Winthrop High School: (Main Street): Rt. 1 south to Rt. 60 East to Rt. IA south. Take first left beyond Suffolk Downs ("Madonna Hill"). Look for signs for Rt. 145. Take Rt. 145 into Winthrop. On Main St. in Winthrop, bear right at third set of lights. High School is on left.